As promised, I am continuing with my follow ups in honor of the half-year. In terms of May 2011 follow ups, as you may recall, dear reader, I spoke about The Five Boro Bike Tour, at the onset of that month (in blog posts that you may refer to by clicking here and here). 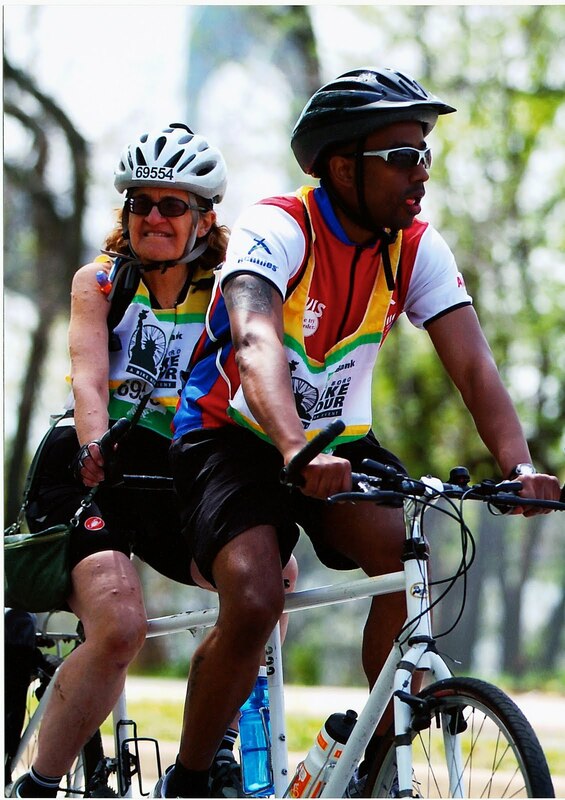 In the latter of these posts, I expressed gratitude for Max Osso being able to step in that the last minute when my regular captain, Zoe Waldron, hurt her Achilles tendon, but thankfully, she graciously loaned us her tandem, so that we could participate in the event. 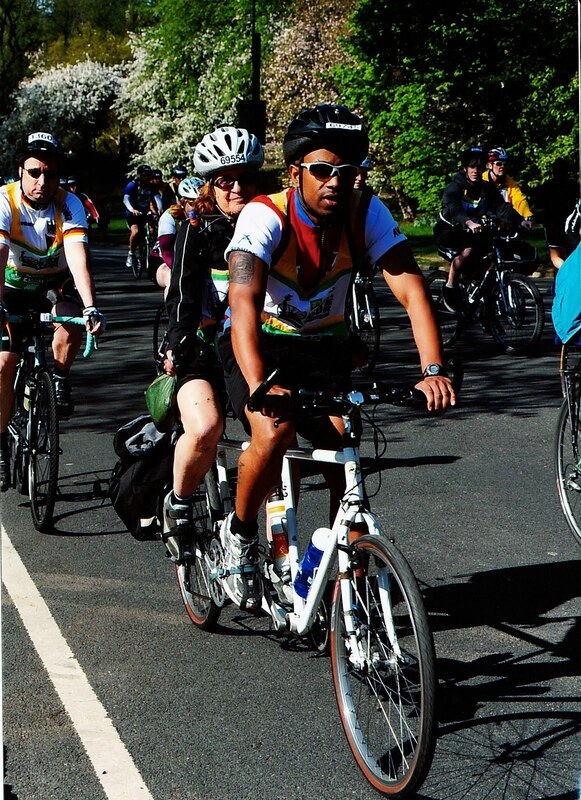 Fortunately, she ultimately recovered for the most part, and has cycled "solo" as well as with me on a tandem on a number of occasions since that time. Additionally, since my May 2011 posting, I have received photographs, purchased by Achilles from Brightroom, of Max Osso and yours truly in various stages of The Five Boro Bike Tour, and I have posted one of them above today's blog entry that shows us cycling in Central Park, and one below which was taken early on in the tour. Also in May, on May 11th, to be exact, my flowers quoted Dr, Suess saying, "Today was good, today was fun, tomorrow is another one", and now in this half-year follow-up, I can attest to the fact that indeed, they are having fun as evidenced by the photographs of some of my honeysuckle flowers posted below. 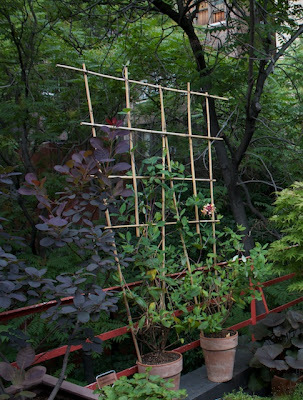 enjoying the trellis which, as you may recall, dear reader, was installed (to serve as a hedge) on May 17th 2011. In another posting, this past May, the birth of my H.F. Young Clematis's flowers was announced in an entry that you may refer to by clicking here. 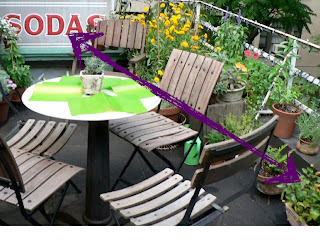 My H.F. Young Clematis's flowers were indeed a beautiful asset to my terrace garden; however, they have a short life. 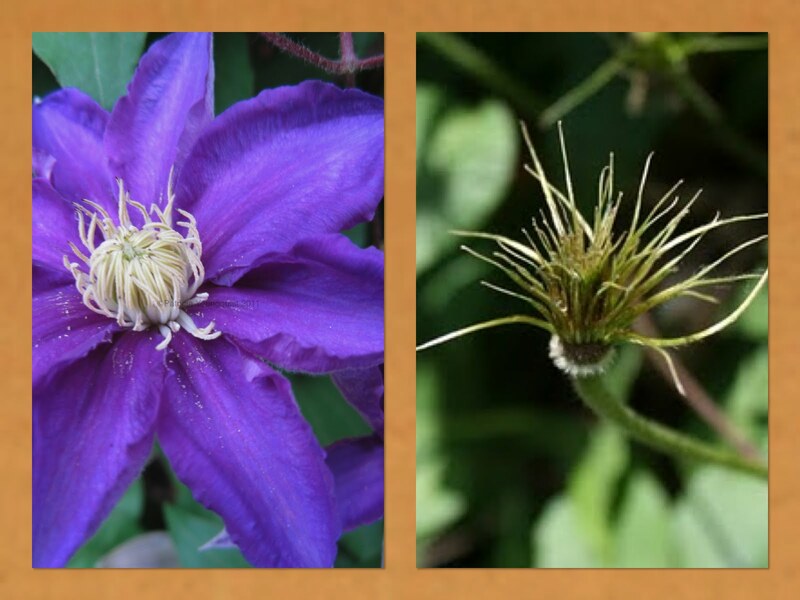 Since their departure, they have left me with beautiful, yet playful, "hairy" pods, as evidenced in the collage featuring one of them in both flower and pod which is posted below. 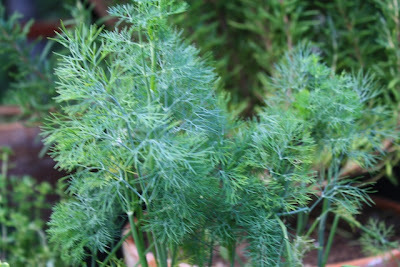 The follow ups for June 2011 include news on my Anethum graveolens (Dill), which I wrote about approximentaly ten days ago. (This may be referred to by clicking here.) Since that time, a change has already occurred, it is sporting little yellow flowers as seen in the image seen below. (I am in the process of rendering this image into a note-card and will release details as soon as they are available). In March, I posted a few entries about my appreciation for the trainers at the Apple Store on the upper westside of Manhattan, and if you'd like, you may refer to those posts by clicking here and here. Since that time a few trainers have left that store, including Tim Larsen, whose doing so was addressed in a comment, made by someone who read a blog posting that I had made this past November. Happy Half Year Eve, to you, dear reader, Happy Half Year Eve to you! By the end of today, June 30th 2011, the year of 2011 will be at its half point, causing me to remember a quote that I heard sometime ago from Rabbi Joseph Potasnik, as I was "radio surfing." The quote is this, "It is said the pessimist sees the glass as half-empty the optomist sees it as half-full, and the realist sees a need for a new glass." Having been made aware of this quote, I ask you, dear reader, how do you see the date of June 30th 2011? Since this year of 2011 is half over, do you feel you are on your way to a goal in any New Year's resolutions you may have made at the onset of the year? Or do you feel that you blew it (in terms of your resolutions) early on, and have therefore abandoned a certain hope in terms fulfilling any promises that you made for yourself? In other words, is this half-way marker of the 2011 year a chance for you to begin again, or is it another reason to berate yourself for resolutions not kept, which is why yours truly does not make any such promises (as discussed in previous post which you may refer to by clicking here) to herself in the first place. Since we are reaching the mid-point for the half year, I'd like to take the opportunity to follow up on certain blog posts that I have made for the year thus far. I am doing this because often I read blogs where the blogger will throw out ideas or concerns and then never mention them again. However, this is not the case with Ms. Fabio, whose blogs I cited in a post made a few weeks ago which you can read by clicking here. Ms. Fabio's blogs, unlike other blogs that I've read, makes it a point to follow up on incidents that she brings to her reader's attention, and since I appreciate that about her, and I imagine her followers do as well, I would like to offer follow-ups on some of the things that I've mentioned, and what better time to do so then at the year's mid point? I have divided these follow-ups into three separate segments. Do you recall, dear reader, that back on January 27th of this year, when my terrace garden was buried in snow, that I wrote about the fact that the snow-filled branches of my Continus Coggygria (Smokey Bush) resembled snow cones? The image in the top left-hand corner of the collage posted below may strike your memory, and, if you'd like to refer to that post please click here. In any event, the "look" of snow-cones, on my Continus Coggygria (Smokey Bush), has obviously changed with the season, especially now that the "official" season for indulging in snow-cones has arrived in New York City. 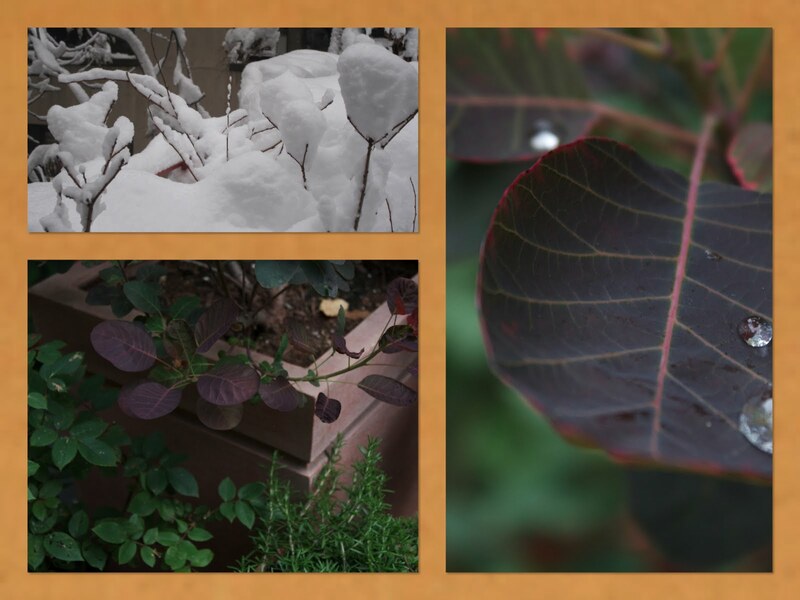 Meanwhile, while folks are enjoying their summer by sipping on snow cones, the beautiful burgundy leaves of my Continus Coggygria (Smokey Bush), are loving the summer too, as evidenced by the photographs in the right portion — as well as the lower right-hand corner of the photo-collage posted above. One nice thing about seasons is the realization that life is always changing; and if you are going through a rough moment it will eventually change just as the seasons do. Where is my Spilanthes oleracea when I need him? Whether you perceive the Spilanthes oleracea plant to be funky or not, it does provide a unique purpose to one's garden as it is a documented fact that when one chews on the leaves, one experiences a numbing effect on the mouth. According to an herb guide (source can be found by clicking here), "a decoction or infusion of the leaves is recommended for stammering, toothache, stomatitis, and throat complaints," and that eating a whole flower bud results in an extremely strong tingling sensation accompanied by excessive saliva production." I was not taking many pictures or blogging during that time, but I can assure you that he can be seen in the far right hand corner where the purple arrow is pointing (on a direct diagonal from the SODAS sign which I only recently removed from my urban terrace garden, a gesture that I wrote about in a previous blog entry that you may refer to by clicking here). The normally perennial Spilanthes oleracea plant, in the zone where I live and have my terrace garden is an annual. 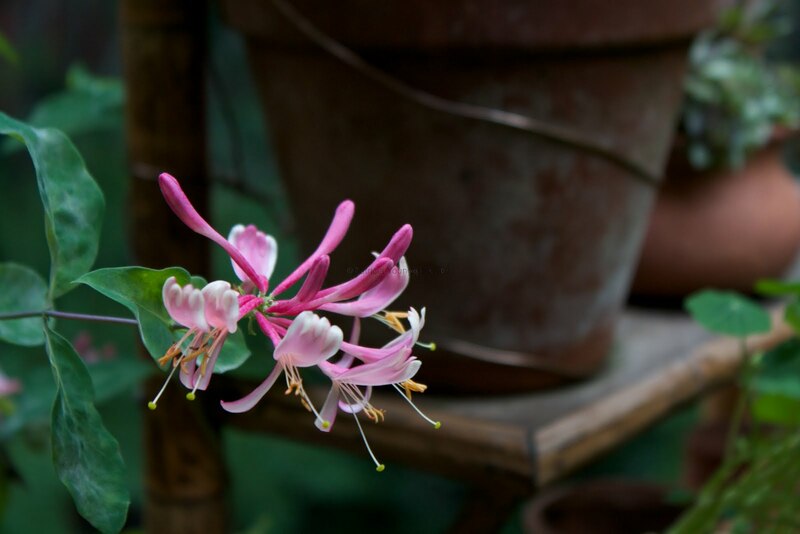 Therefore, I am not always able to find them in any of the green-makets when growing season arrives; hence, I have not had one in my garden for a number of years. However, the Spilanthes oleracea plant is on my mind today, as I am scheduled to have a tooth extraction this afternoon —an unfortunate necessity precipitated by its being fractured. 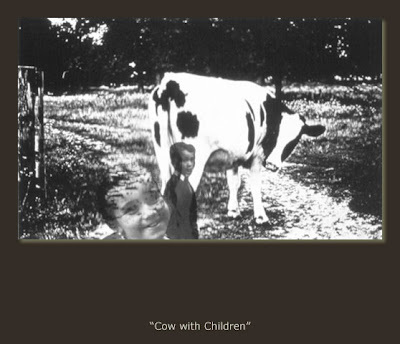 "Cows, Bread and Autism", Bobolink's Answer To What's Cheese got to do with it? Like parsley and fennel, dill (Anethum graveolens), is a member of the Umbelliferare family, known for its distinct umbrella-shaped inflorescences. I grow Anethum graveolens, and it is truly an exquisite addition to my garden. 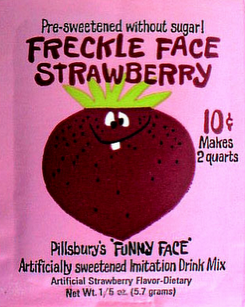 It is wonderful to use in homemade soups, scones, and in cookies. However, I confess that I rarely use it for such purposes because like my Tropaelum majus (Nasturtium) and my Strawberries, (plants that I have discussed in previous posts which you can refer to by clicking here and here respectively), I often find the beauty which it adds to my urban terrace garden, keeps me from cutting it. I have just recently learned that dill "regularly appears under the misnomer 'anise' throughout the King James version of the Bible", and, that "confusion has continued to be perpetuated partly because botanists and zoologists were not part of the team of transcribers of this authorized interpretation; and so the apricot that Adam and Eve ate became an apple, the crocodile became a whale, the bull became a unicorn and dill became anise." My source on this trivia is credited to Abbie Zabar who included it in her book, The Potted Herb, a delightful read with beautiful drawings. Today, June 20, 2011, is the summer solstice, the longest day of the year in terms of daylight, and the first day of summer. Although it would be lovely to ring in summer in Claude Monet's garden in Giverny, I am doing the next best thing: bringing Giverny to my urban terrace garden in New York City by planting Tropaelum majus (Nasturtium) , a plant that I have enjoyed over the years, but one that has not done well in my terrace garden. 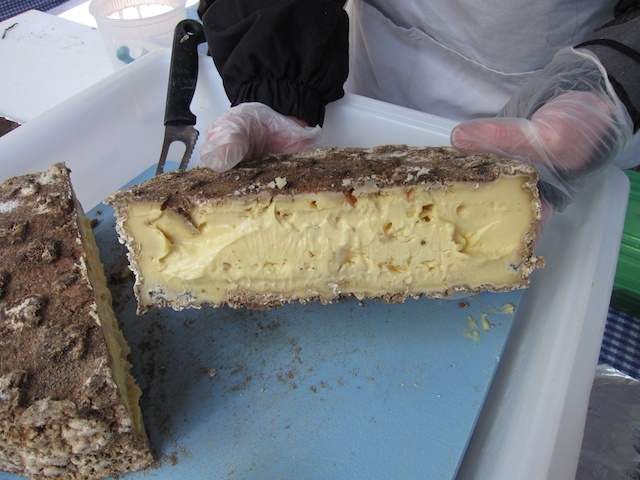 Goat Berries and Bleeding Espresso: What's cheese got to do with it? 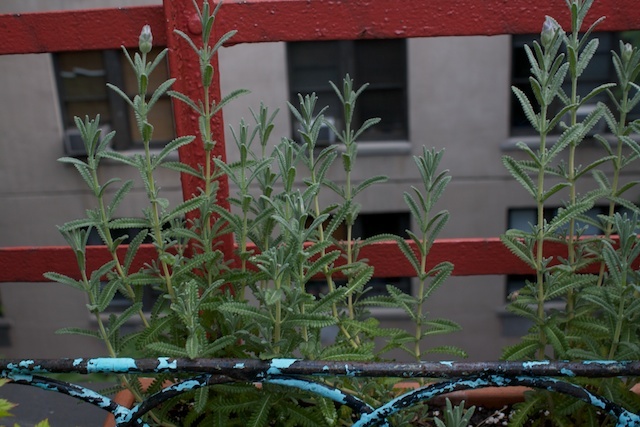 It was April 18th 2011 (exactly two months ago), and the herbs, plants, shrubs, and trees which I grow in my rooftop garden had just been unwrapped two days prior, from the garden winterizing that I had done with Juan V, in December of 2010. 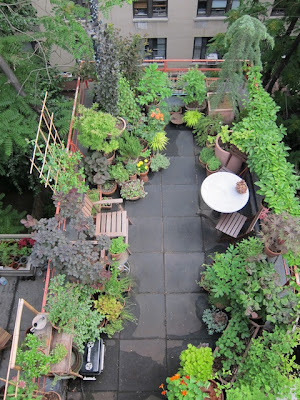 I was low on inspiration in terms of writing about any of the things that I grow in my rooftop garden. Yesterday, Juan V came over to help me with some gardening work, and I told him about the D–Man’s garden, and that I had given him my left over bamboo stakes so that he could build a trellis, since the D–Man had commented on my blog about the smoking/gawking neighbors that we have in common — the neighbors who tend to invade our respective gardens, much like the ants that we both appear to have. 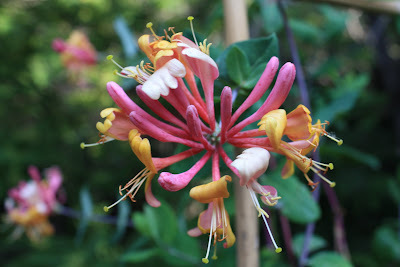 If you’d like to reread any details regarding garden invading neighbors spurring on the need for an urban trellis, or combating garden ants, or the D–man, please click on these respective links: gawking neighbors as impetus for a trellis to train Honeysuckle Vines, pesky ants that make themselves at home on my Paeonia suffruiticosa (Tree Peony), and, of course, the D–man, a young gardener, whom I mentioned in yesterday's blog entry. 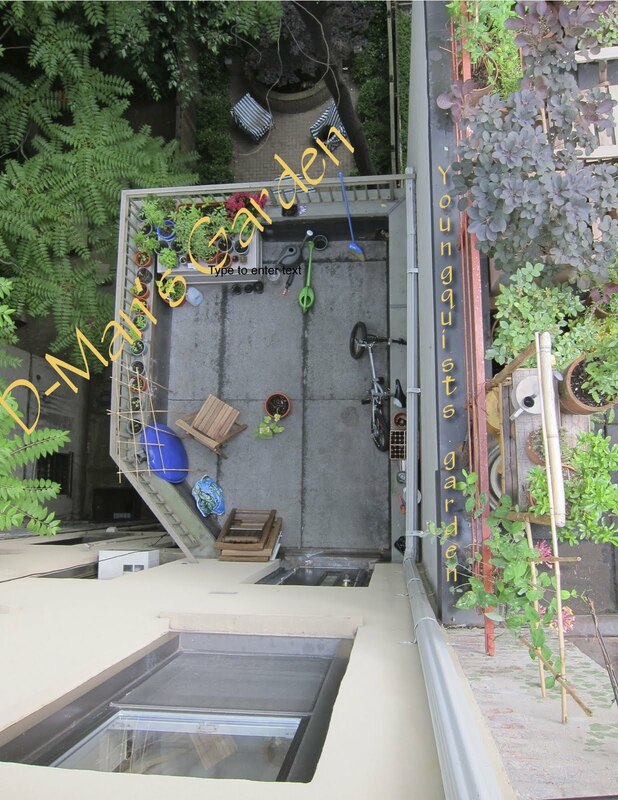 Upon hearing about the D–man’s endeavors, Juan V was as touched by his efforts as I am, and so, when Juan V photographed yesterday’s aerial view of my garden, he took one of the D–man’s garden. 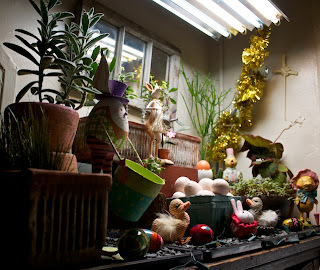 The resulting images have been posted at the top of today's blog entry. Meanwhile, unbeknownst to Juan V and me, the D–man was apparently busy at work on his computer uploading his second video to You Tube which you can view by going to this link: My little Pumpkin Plant: Patio garden update! It is exciting to learn of the D–man’s adventures with his garden. 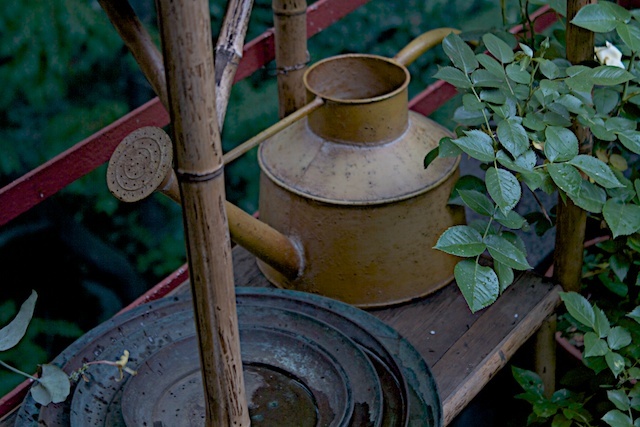 It is also most touching to know of the D–man’s sensitivity in expressing appreciation (as he did for the extra bamboo stakes and watering cans that I gave him for his garden) because such attention to detail will surely make his garden flourish. 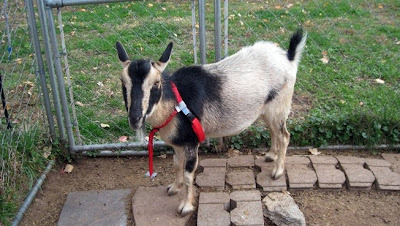 However, while I appreciate the D–man’s giving a “shout” out to my blog and garden, I can assure you, dear reader, as you most likely know, that in giving, we receive. 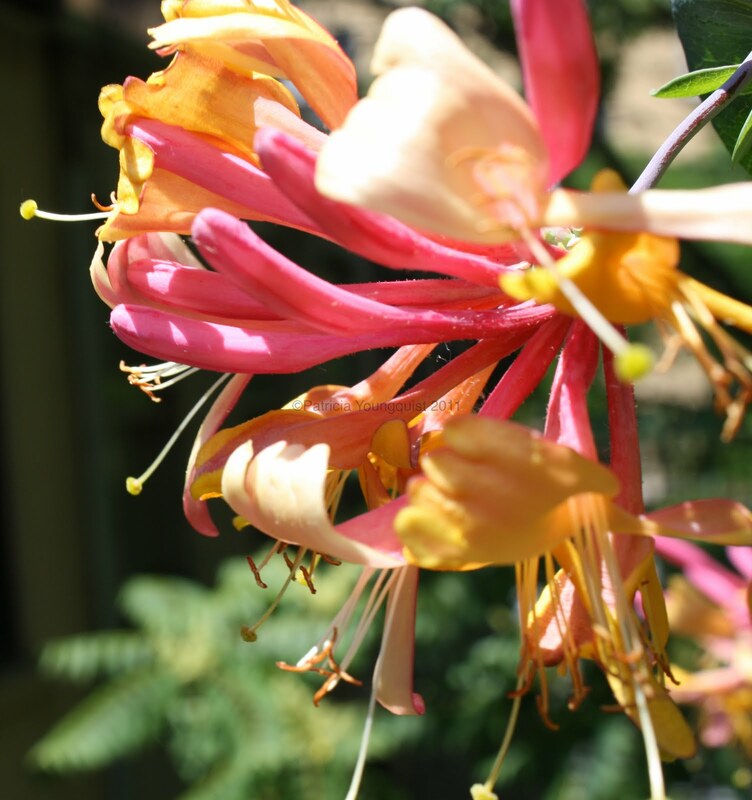 Seeing the enthusiasm and excitement of D–man’s reaction to all of the nuances in his garden will surely help other gardeners to grow in their efforts to embrace the smallest pleasure one receives when he/she gardens. It is somewhat serendipitous that evidently at the same time that I was telling Juan V about the D–man, and perhaps even while Juan V was photographing the gardens, that the D–man was inside his home posting about our mutual gardens. Indeed, proved once again, that great minds such as those of Juan V and the D–man think alike. Thursday's Testimony: "Loving the art in yourself and not yourself in the art . . "
The image posted above shows a sideway view of the trellis that Juan V built (in May of 2011), using bamboo stakes that I had left over from 2006, when I used them to manage a tomato plant that had gotten out of control. You may recall, dear reader, that in my posting, "Love thy Neighbor — but don't pull down your hedge," I not only discussed Juan's structure, but I also wrote about a terrace on a building two doors west of me, which is used by folks whose sole reason to go outside seems to be to pull up a chair and stare at my terrace, which often makes me feel vulnerable when tending to my garden. 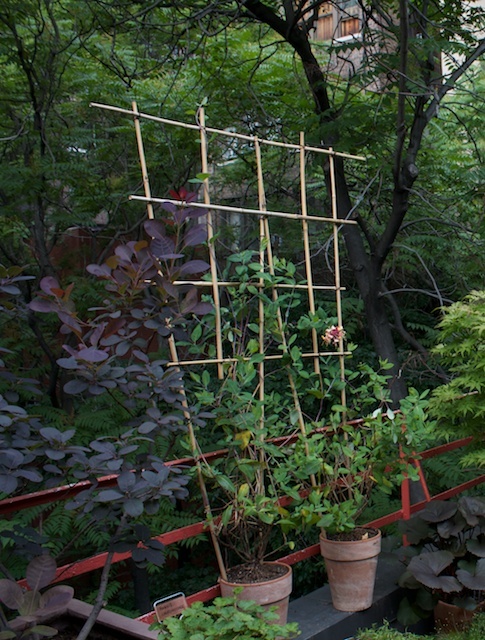 Their behavior was my motivation to put up an "urban hedge" — a bamboo trellis which will hopefully soon be filled with flowers from the Honeysuckle Vines that are being trained to crawl on the trellis. In any event, I have received a heartfelt comment on that blog entry from D-Man, which reads, "Very nice garden! I wish I could get privacy from those neighbors also. They just stare at me and smoke when I tend to my garden." D-Man is a young boy who lives in the building which is in between my building and the building that has the terrace where gawkers and smokers abide. He maintains a garden on a terrace one level below mine, and he is new to gardening. My they grow up so fast! 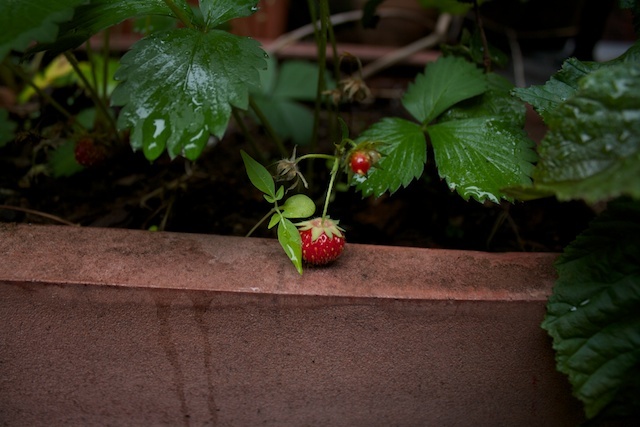 I am following up on my post of June 4th 2011 (which you can refer to by clicking here), to show you, dear reader, how much Danielle Rosa’s garden has thrived in less than a month’s time! From the photographs posted above sent to me by her mother, Patricia Rosa, one can see the growth in the tomatoes planted in the back, and with the basil planted in the front. The rows (left to right) have beets, hot peppers carrots, kale, beans, leeks and swiss chard, and, the last two rows have a variety of lettuces. This past Sunday was the Feast of Pentecost, which ends the Easter Season, and, even though the Easter Season is a fifty day celebration, I am already feeling a bit unfulfilled — despite my participation in the intense Easter observances as well as the preparation for them during Lent. Therefore, I was consoled to read the following comment by the blogger, Emily L. Hauser who is referring to her experience with her 2011 Passover celebrations. Hauser writes, "It really does seem that every year, Passover goes by faster. One minute I'm hyperventilating over the inhumane amount of cleaning, the next minute I'm saying 'what, it's over?' But here we are. Tonight is the start of the second holiday, the one that closes the week, and boom — its back to bread." I realize that Passover 2011 ended quite some time ago, and that for Ms. Hauser the festival of Shavuot (which is symbolically and historically related to Pentecost) was last week, but it is aways comforting to be reminded of the fact that my emotions are hardly unique to me, and that, in fact quite often, they transcend cultures and belief systems. Perhaps, you recall, dear reader, that over three weeks ago (May 14th 2011), I posted an entry titled "I've NEVER seen a billboard lovely as a tree . . " (which you may refer to by clicking here). You may also recall that an antique sign bearing the word "SODAS", was the subject of that post, and was an item that used to be placed where I now have Lavandula angustifolia, growing in a window box placed inside an old fireplace fixture that has been located in almost every area of my terrace garden over the years. It is said that strawberries are the first fruits to ripen in the spring, but apparently the strawberry plants which I have in my urban terrace garden, are not paying attention to the calendar, as they are only now beginning to produce fruit, and today is already June 7th 2011, thus bringing the first week of June to a close! It looks like it will be a while before I am able to indulge in strawberries and cream (as far as these guys are concerned), but, if truth be told, I think they are too cute to cut from their stems. Tomorrow, June 5th, is World Environment Day (WED), and, according to Wikipedia, it is a day which, since 1973, has offered a mission that "stimulates awareness of the environment, and enhances political action", taking on different themes in a given year, and giving different countries the opportunity to be the host. For example, in 2009, the theme was Your Planet Needs You — UNite to Combat Climate Change, with Mexico serving as the host, and, in 2008, the theme was CO2, Kick the Habit! Towards a Low Carbon Economy, with New Zealand hosting, and, in 2007, the topic was Melting Ice — a Hot Topic, which was hosted in Norway. For a list of themes and host countries, going back to 1974, dear reader, please, refer to the Wikipedia link mentioned earlier in this post. 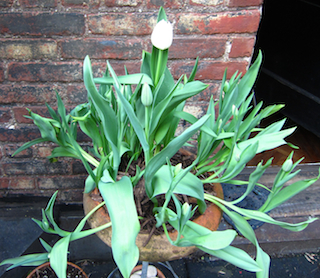 I have chosen to mention WED in today's blog entry because folks who refer to blogs that discuss gardening, such as mine, often have an interest in the environment, and, that being the case, I would guess that many of you readers are aware of WED. Therefore, I will leave the details of past issues that WED has raised, as well as the given host countries who participated in WED's promoting awareness on environmental concerns, to focus on my thought for today's blog post, which is, on this eve of WED, to give a shout out to Danielle Rosa, who has taken the opportunity to make the environment a better place in ways that do not always bring as much recognition as they do when efforts are made on a global scale. It is my hope that Danielle's actions will inspire others to do the same. Danielle Rosa is the youngest daughter of Patricia Rosa, a textile designer and quilt maker, who recently attributed much of her inspiration to nature's colors. You may recall, dear reader, that I mentioned this fact in a previous blog entry (on April 19th 2011), and, if you'd like to refer to that blog post, please click here. In that post, I made mention of Ms. Rosa's daughter, Danielle, and now, Danielle, and her recent gardening endeavors, is the topic for today's post. My dear reader, for any of you that are procrastinators (like yours truly), and never got around to sending Easter cards to those near (and not so dear) to you that honor the day, fear not; it's not too late for you to send a card to express your thoughts (and hopefully you will choose ones from the selections in the store-front of my web-site for such purposes) because we are still in the Easter Season, and will be until Sunday, June 12th, 2011, when the Feast of Pentecost will close the Easter Season. 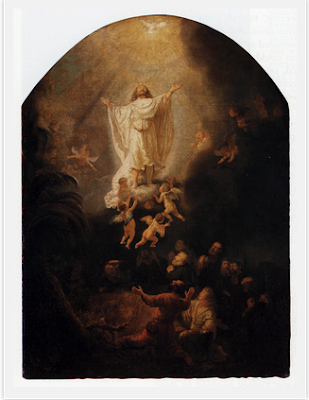 Meanwhile, today is Ascension Day, one of the feasts of the Easter Season. The observance of Ascension Day dates back to the latter part of the fourth century. Well, dear reader, according to the comic strip Mutts, created by Patrick McDonnell, which is an animation that I adore (and one that I have sighted in a previous post that can be found by clicking here), we are in "half time", and, while I appreciate this animation (and often the sentiment that goes with it); I do not think "half-time" officially begins until the end of June, as that is the time the calendar year is half over, or perhaps, and maybe even more important, is the time of the onset of the remaining part of the year, and a chance to begin again.